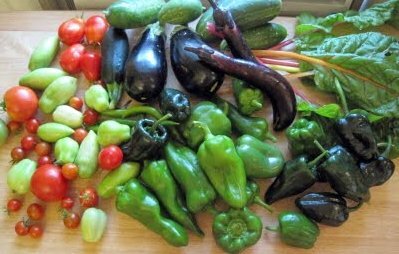 A mid-August Harvest of tomatoes, peppers, eggplant, cukes, and chard! Gardening hasn't been easy this year. Far from it. I had a lot of work-related travel in the spring and didn't start my own seeds. I moved on July 1 so I didn't want to plant everything in the ground at my old place (even though my landlord wanted me to because he loved my veggie garden so much). As a result, I spent a lot of money on containers to prepare for a move across town. The garden at the old place. I still stop by to pick and water. I tried to go more organic, so I spent more on organic soil mixes. I let seedlings get root bound before I had time to plant them. I've lost precious canning tomatoes to blight and cherry tomatoes to splitting caused by excessive rain. And I haven't had time to pickle all the cucumbers so a few mushy ones have found an unfortunate home in the trash (no composter at the new place... yet). To make matters worse, it's been a really busy summer with a lot of weekends away and without time to share the yields with friends at my dinner parties. It would be easy to let all this get me down, but how can I when the fruits of my labor are so rewarding and, dare I say, delicious. Sure, I planted too many peppers and the dill didn't last too long, but growing your own food is about so much more than picking perfect sun-ripened tomatoes. Herbs in pots. Peppers, eggplant, cukes, chard in earth boxes. The garden is a place of peace for me (when I have time to spend in it) and it's a place for learning. This year, I learned more about container gardening and now I feel like a real urban gardener. I've learned new ways to prepare eggplant (baba ghanoush anyone?) and how to can in a pressure cooker. New uses for my vita-mix have emerged. I've eaten more salad. I've perfected my pesto recipe and have gotten better at giving my precious veggies to neighbors, friends, and coworkers. It's been really rewarding, so I wanted to share a few of my favorite garden moments and some pictures from so far this summer. The plan was to move these boxes to the new place, but the plants got too big! My not-yet-2-year-old niece instinctively picked and ate a cherry tomato right off the plant in my front yard. It was the cutest thing I've ever seen. I wish I had a picture. Shopping at Weston Nursuries with James and the $100 gift certificate I got for making my first ever donation to public radio. I listen to WBUR every day and was so excited when I heard about that reward that I had to call in and fork over $200! Well worth it for the glazed strawberry pot I planted my chamomile, thyme, rosemary, sage, marjoram, parsley, and more in. I picked a handful of raspberries... at once! And then immediately ate them all. By myself. Without telling anyone (until now that is). Making tomato sauce from scratch with a collection of tomatoes from my garden and from my mother's garden and then using that sauce to make eggplant and zucchini parmigiana to bring to my grandmother's for her 73rd birthday party. Grilling eggplant, zucchini, and peppers and eating them for countless dinners then chopping up the leftovers for countless lunch salads. Giving peppers and cucumbers to my current landlord. I'm working up to asking to plant on their side lawn next season! I've been meaning to post this recipe for a while, but don't let that stop you from trying it! More to come from the garden. Although some of my plants have been over-watered by mother nature and neglected by me, they're plants and they're resilient. If I can manage to harvest a couple pounds of produce a week from containers and a small patch of dirt just outside of Boston after the last few crazy hectic months of travelling, moving, and downpours, it can't be that hard to grow something to feed yourself. It's amazing what some fresh pesto can do to a piece of bread pasta zucchini. If I can do it, trust me... so can you! By the way, there's still time. I'm hoping to plant some more lettuce (mine went to seed a few weeks ago after a few hot days) and maybe some kale (will grow through the frost) and potatoes and beets. What do you want to grow? Leave a comment and I'll respond with a tip or two for you! This post from Dillan DiGiovanni, CHC at Savor Your Existence Integrative Health. Dillan is a board-certified holistic health coach. She sends out a great weekly newsletter with tips for healthy living and was kind enough to let me borrow this amazing recipe from her blog to share with you! There is a healthy restaurant nearby that is all the rage right now. Rage? Rave? Which is it? At any rate, I haven't been there too much (to everyone's surprise) because the truth is, I don't want to spend hard-earned cash on food I can make for myself--and should be making for myself. Homemade granola, right out of the oven! I love granola. I eat it with low-fat Greek yogurt and seasonal (or frozen) fruit for brunch at my desk and snack on it in the afternoon. I top ice cream and sorbet with it for dessert. Sometimes, I just eat it by the handful. I usually buy my granola at the Union Square Farmers Market. Cooks Farm Orchard sells a bag with rolled oats, almonds, coconut, wheat germ, maple syrup, cranberries, sesame seeds, and oil that is pretty tasty. When I'm in NY visiting my family, I pick up at least a bag of Platte Clove Naturals Granola at the Kingston Farmers Market. My favorite is their maple ginger with cranberries. So good! Wet: Canola Oil, Maple Syrup, Extract. Dry: Oats, Nuts, Seeds, Spices, etc. Combine all of the dry ingredients in a large bowl. Wisk the wet ingredients together in a small bowl. Pour the wet ingredients over the dry ingredients and stir well to coat the dry stuff with the wet stuff. Stir well to coat all the dry ingredients well! Pour into a 9x13 pyrex. Spread with the back of a spoon to even out the top. Press the raisins (and dried cranberries) through the surface into the mixture. Hide the raisins and craisins! Bake at 250 for 60 minutes or until golden. Warning: This will make your house smell delicious! Make sure you have someone to share this with or bring some to work, because this recipe yields about 10 cups. I'll be making it weekly and trying different variations. What do you suggest I put in my next batch of granola? Eat a few spoonfuls, let it cool, and spoon into mason jars to store. Should keep in a cool dry place for a week or two. Amazing. Thanks again, Terry! I've made this dish a variety of ways over the past few years and just got a request for the recipe from a friend who just moved across the country, so I figured I'd share it with everyone. Practically everyone I've made it for has asked for the recipe, so here it is! The main ingredients are at peak season now, so you should be able to make this tasty dinner after a quick trip to the farmers market. It's healthy, vegetarian, absolutely delicious and extremely easy to make. Vegan? Just leave out the cheese! If you haven't discovered quinoa yet, this is the perfect recipe to try it in, but just about any grain can be substituted for the quinoa in this recipe. Just follow the cooking instructions for the grain (usually 1 part grain to 2 parts liquid in a rice cooker will do the trick). Start off with the largest zucchini you can find! You can use other veggies if you want (peppers, tomatoes, squash, eggplant, etc). Cut zucchini in half length-wise and use a spoon to hollow out the seeds and the "meat." Be sure to leave a decent shell in place so that the zucchini will support the stuffing later. Throw the seeds away, set the substance aside. Season the zucchini with a spray of olive oil and sprinkle of sea salt and some freshly ground black pepper. Place zucchini in a baking dish and stick it in that pre-heated oven while preparing the stuffing (timesaver!). Cook 1 cup of quinoa in veggie stock. You can follow the stove top cooking directions on the box or use a rice-cooker and 2 cups of veggie stock. Feel free to flavor the stock with some garlic, basil, etc. I like to throw in a few sun-dried tomatoes. A note about quinoa: Quinoa (pronounced keen-wah) is amazing. It's a whole grain that comes from South America and has more protein and fiber than brown rice. It can be found at most grocery stores in the 'alternative' or 'organic' aisles or near the rice and other grains. If you don't have quinoa, you can substitute any grain. Mix 1 can of petite diced tomatoes (fresh tomatoes work, too) and 3 cloves of minced garlic with the cooked quinoa. Add lots of herbs of your choice (I like lots of chopped oregano, basil, and parsley and a pinch of thyme... fresh when possible) and 1 cup of grated cheese (Pecorino Romano or Parmigiano-Reggiano). While the quinoa and cheese provides plenty of protein, feel free to add a can of white kidney beans for a more substantial main course. Chopped olives can also be added if you like. This is the "Italian" version. For the "Mexican" version, use oregano, cilantro, cayenne, and chili powder for your spices (no basil or parsley), shredded cheddar or jack and black beans. Note: It's OK to go ahead and eat a few spoonfuls of this delicious stuffing base! In fact, it's encouraged, so that you can go ahead and season more if you want... I promise that it doesn't need egg, breadcrumbs, or meat (but go ahead and add some if you insist).Now, remove the veggies from the stove and mix into the quinoa stuffing. Pull the zucchini out of the oven (should be about 1/2 cooked). Stuff the zucchini, top with some more cheese (pecorino tuscano is the choice cheese here, but use whatever you like), and put in the oven at 400 degrees for about 20 min. Broil for the last few minutes to crisp the top.... and VIOLA! Need something else to put on the plate? Try a tomato-cucumber salad. Yum! In my quest to eat as close to the source of my food and to eat as clean (sustainable, plant-based, healthy, and environmentally friendly) as possible, my kitchen has undergone significant transformation over the past few years (pictures coming). I've added small appliances like my prized Vita-mix to help with daily smoothies, weekly batches of hummus, seasonal pestos and dressings, blended soups, and homemade nut butters and flour as well as a Kitchen-Aid stand mixer to make grating, shredding, slicing, and baking easier. I bought myself a pressure cooker so I could start pressure-canning and stop buying canned beans that come with BPA, added salt, and the additional greenhouses gasses caused by trucking heavy cans across the country. And after reading Animal Vegetable Miracle last year, I set my eye on a breadmaker. Grocery store bread leaves so much to be desired and loaves bought at the farmers market or the local bakery cost up to $6 each. My mom and my sister chipped in to get me a breadmaker for my birthday at the beginning of the summer and, just like all the other kitchen tools mentioned above, it has helped me get closer to my food. While these large investments of money and time may seem extreme, I know that I'll save money over the long run by cooking beans and bread from scratch. I'll be doing more for my health and for the environment, too. With a busy schedule and my obsession with comparison shopping to find the best value, I've found myself turning to Amazon more than ever these days. Here are some of my favorite Amazon finds to help you stock your clean kitchen and below, you'll find today's shopping list. When it comes to stocking my shelves, I've had to buy a lot of ingredients I've barely heard of to prepare new foods I've never cooked before. Terry Walters' Clean Food and Clean Start books have been helpful when it comes to crafting shopping lists to stock my clean pantry. On the other hand, I've spent hours paging through the recipes from the whole grain bread cookbook I bought and still find myself trying to bake loaves of bread only to discover that I'm missing one or two key ingredients (buckwheat flour, anyone?). What's on YOUR shopping list this week? Can you eliminate a packaged food, like bread or cookies, and try to make your own?